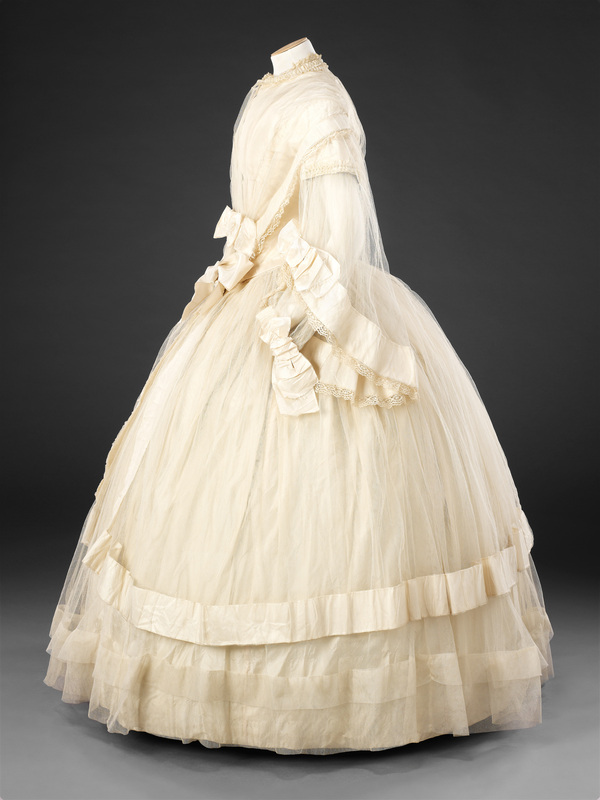 As we have no provenance for this dress we do not know for certain that it is a wedding dress. It is, however, very close in style to those illustrated in contemporary fashion plates, and its billowing skirts of fine creamy-white fabric, ornate sleeves and profuse ribbon and lace trimmings give it a sense of occasion. 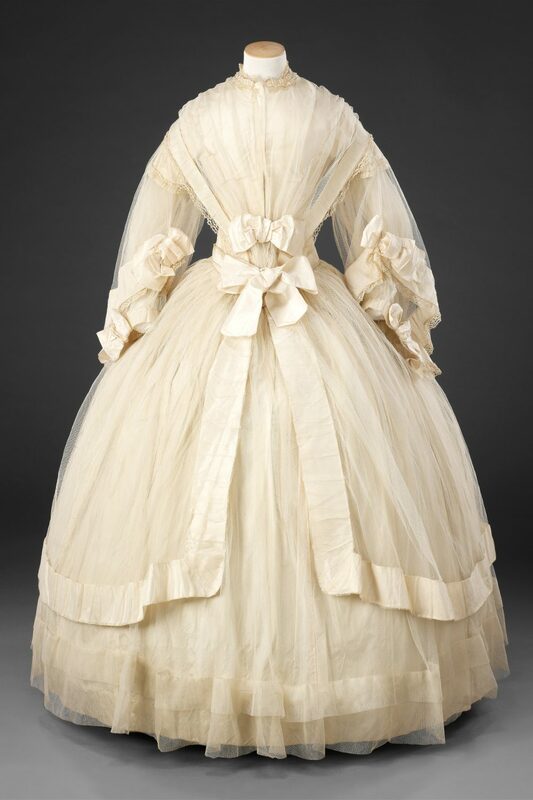 Its high neckline and long sleeves suggest that it was worn during the day, as marriages took place before noon at the time, and also symbolised the bride’s modesty and purity. 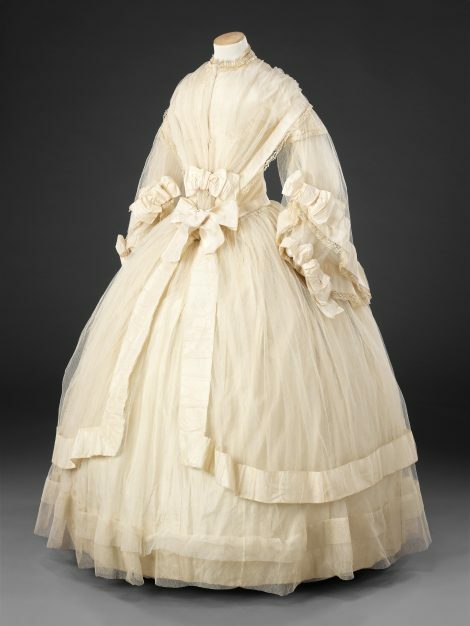 It would have been worn with a veil, or a bonnet and veil, trimmed with orange blossom, and the bouquet, if carried, would have been small and compact. 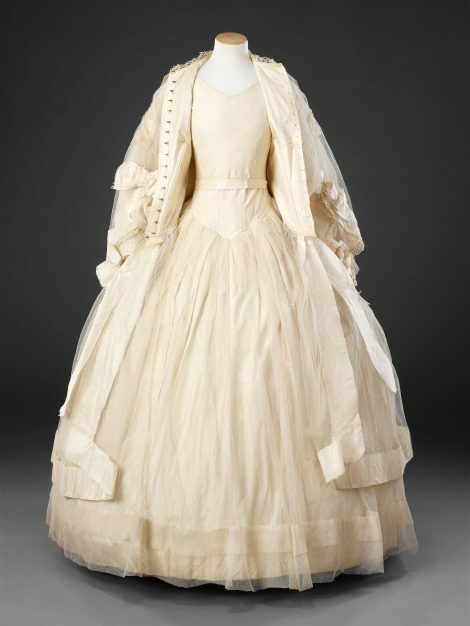 A series of royal weddings in the middle years of the 19th century helped popularise richly trimmed white wedding gowns, although the custom of wearing a coloured outfit that would see service in the coming years continued. 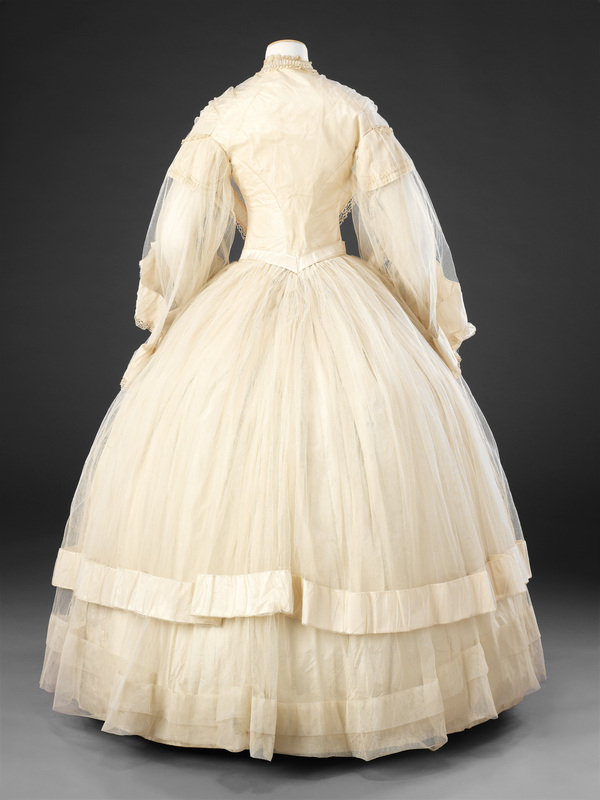 The dress is in two parts. The bodice is tulle mounted on silk with separate tulle panels attached at the waist, its sleeves comprise undersleeves gathered into the wrist, and pagoda oversleeves, both of unlined tulle; the three-quarter length overskirt, open at centre front, is joined to the bodice at the waist. All are generously trimmed with ribbon and lace. 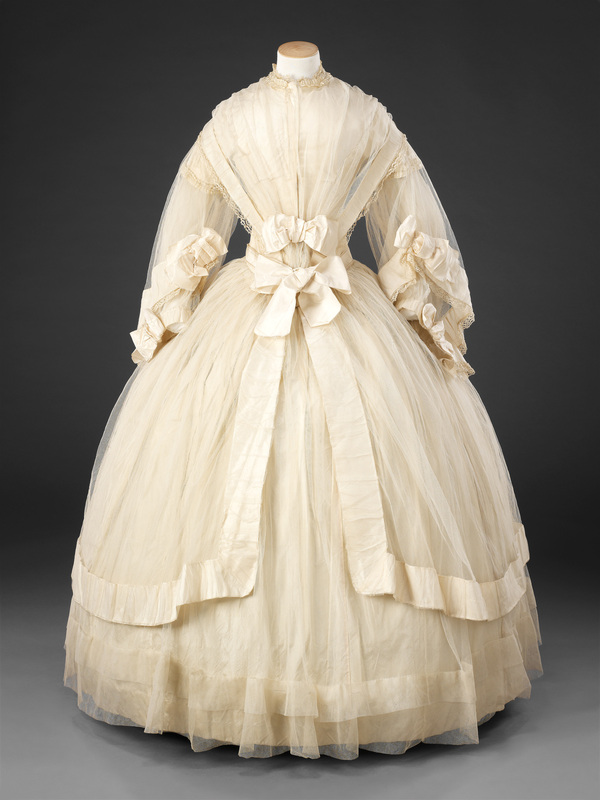 The underskirt, lined in taffeta, is attached to a sleeveless cotton twill underbodice (See Additional Images). 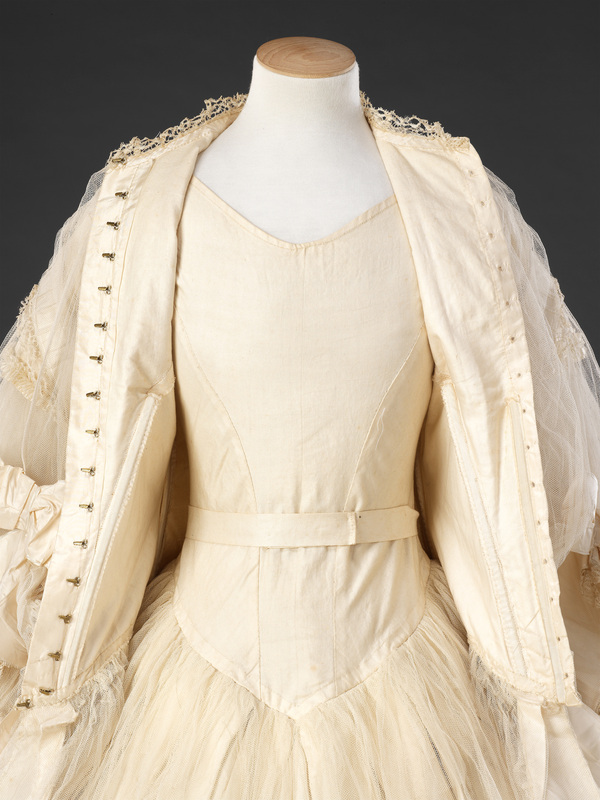 An inner waistband, sewn to the centre back of the bodice lining, anchors the two components of the dress.